Just in time for GraphQL Summit is Neo4j's new GRANDstack! Check out what it will mean for developers and how you can get involved in using it right away! The Neo4j Developer Relations team is tasked with making sure developers can build applications backed by Neo4j using their favorite technologies. One technology we’ve been really excited about recently is GraphQL. GraphQL is a relatively new paradigm for building APIs. You can learn more about GraphQL by reading this ref-card. The DevRel Engineering team has spent some time building integrations around GraphQL and Neo4j, and we’re happy to share them with you! Already in its second year, GraphQL Summit is a developer-focused conference showcasing how developers are using GraphQL. At GraphQL Summit, Will and Michael presented our integrations of GraphQL for Neo4j. We really enjoyed the conference, and spoke to a lot of developers from startups and surprisingly a significant number of large companies that started to use GraphQL to unify their API landscape and make it easier to develop applications. The talks covered a wide range of uses, initiatives, problems and solutions around GraphQL. We were especially thrilled by topics around subscriptions, authentication, and open source announcements and launches by IBM, Apollo, and Graphcool. One prominent theme at GraphQL Summit this year was on the ecosystem of tools being developed and made available to the community. This included a new release of the most popular GraphQL client, Apollo Client 2.0. The 2.0 release makes Apollo Client more modular, allowing for more customization and incremental adoption. Apollo Client includes integrations with many frontend frameworks, including React. You can see an example of Apollo Client 2.0 as part of a simple GRANDstack app here. Apollo also demonstrated Engine, their tool for performance tracing, schema management, error tracking and caching. We’re happy to announce the launch of GRANDstack (GraphQL, React, Apollo, Neo4j Database) just in time for GraphQL Summit. GRANDstack is a combination of technologies and integrations to enable full-stack development, taking advantage of synergies and symbiotic relationships between technologies in the stack. If you want to learn more, visit grandstack.io or attend one of our upcoming GRANDstack meetups or training classes. You can also see the slides from Will’s presentations at GraphConnect New York here on neo4j-graphql-js and a GRANDstack overview from the San Francisco JS Meetup here. You can see an example of in this Apollo Launchpad that shows a GraphQL server providing an endpoint for a simple Movie Graph. To try it out, you just fork the launchpad and spin up a Neo4j Recommendations Sandbox and add the credentials as secrets. 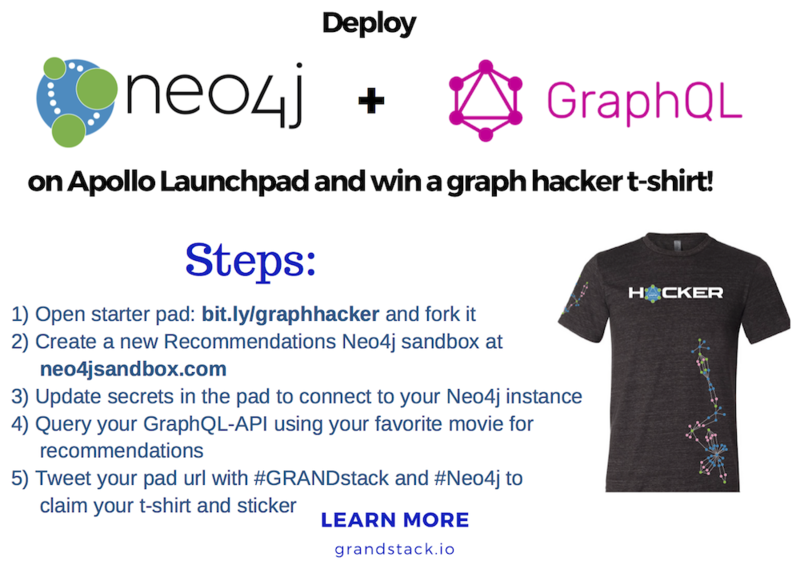 This gives you not just a running GRANDstack backend, but we’ll also send you a Hacker T-shirt and sticker if get your forked Launchpad working with Neo4j. Just tweet out the URL for your working Launchpad with #GRANDstack and #Neo4j to claim your t-shirt and sticker.